Biography/ Paintings of American Impressionist Painter. American Impressionism at its best. After the wealthy Pittsburgh artist Mary Cassatt (1844-1926) - Childe Hassam is the American painter most closely associated with Impressionism, a style he developed during a formative 3-year visit to Paris during the mid-1880s. An important figure in late 19th century American art, Hassam was a founder member of the influential modern art group known as "The Ten", and is noted for his paintings of light-dappled gardens, as well as his "Flag Paintings", although he is probably best remembered for his Impressionist cityscapes, notably his depiction of the changing contemporary urban New York scene. 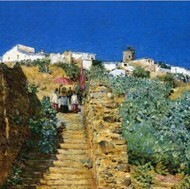 More versatile than American Impressionists like Whistler (18341903), or John Singer Sargent (1856-1925), in addition to his fine art painting, Hassam was an expert in wood engraving and illustration, while in later life he mastered numerous types of printmaking, including etchings and lithographs. A prolific and popular artist, Hassam produced over 3,000 works of art which are represented in all the best art museums in America. Noted paintings include Boston Common at Twilight (1885, Museum of Fine Arts, Boston), Grand Prix Day (1887, MFA, Boston), Evening in New York (1890, Museum of Fine Arts, Houston), Celia Thaxter's Garden (1890, Metropolitan Museum of Art, New York), The Room of Flowers (1894, Private Collection), Fifth Avenue in Winter (1901, Carnegie Musum of Art), and Allies Day, May 1917 (1917, National Gallery of Art, Washington DC). Born in Dorchester, Massachusetts, he received his first lessons in drawing and watercolour painting while at school in Boston, before dropping out (about the age of 13) to earn money as a wood engraver - a discipline at which he rapidly excelled - producing designs for letterheads and newspapers. By the time he was out of his teens he was also accomplished at oil painting, as well as watercolours, his preferred medium, which he did mostly outdoors. His ability as a draftsman encouraged him to become a free-lance illustrator, specializing in magazine and book illustration. He also furthered his talents by taking figure drawing classes at the Lowell Institute and figure painting classes at the Boston Art Club. In 1882, he had his first one-man show at the Williams and Everett Gallery in Boston, at which he exhibited his watercolours. Note: to understand more about Childe Hassam's style of painting, see: Characteristics of Impressionist Painting 1870-1910. Encouraged by this success, Hassam returned home the following year and transferred his studio from Boston to New York, in order to be closer to dealers and collectors, as well as other important painters. He quickly became famous for his seasonal views of the city, a body of work that has helped make these American places as recognizable as Claude Monet's garden at Giverny. 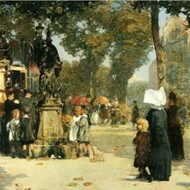 In Washington Arch in Spring (1890), for instance, Hassam shows us a cross-section of American urban life. The aerial view of Union Square in Spring (1896) demonstrates how close in both subject and style Hassam's work is to the street scenes of his French contemporaries - in particular, works like Avenue de l'Opera, Sun on a Winter Morning (1898) by Camille Pissarro and Boulevard des Capucines (1873) by Claude Monet. As well as these urban scenes, another theme he enjoyed was a woman in an interior. All through the 1890s and into the new century, his painting (watercolours as well as oils) became more and more oriented toward Impressionism, even as the idiom itself was being superceded in Paris by Post-Impressionism and the garish Fauvism. Following his return to the US in 1889, Hassam spent many of his summers at a small hotel run by the poet and gardener Celia Thaxter at Appledore, a small island off the New Hampshire coast. Hassam's friendship with Thaxter dated back to the early 1880s, when she had been a pupil in his watercolour class in Boston. While Thaxter celebrated her "natural" (as opposed to "formal") flower garden and the Appledore landscape in poetry, the same scenery inspired some of Hassam's best works of the 1890s, such as Celia Thaxter in Her Garden (1892). For Thaxter's last published book of poems, An Island Garden (1894), Hassam was commissioned to produce watercolour illustrations. 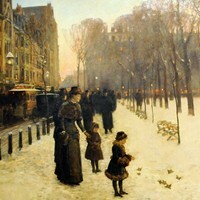 In a sense, Hassam returned to his origins in this project; he had begun his artistic career as a magazine illustrator. After Thaxter's death in 1894, Hassam worked in Old Lyme and Cos Cob, Connecticut, sometimes with J. Alden Weir, before settling finally in East Hampton, Long Island. In all three places he continued to paint garden scenes, delighting in the contrast between the brightness of the blooms and the weathered clapboard buildings against which they were set, as in Old House and Garden, East Hampton, Long Island (1898). During the 1900s, Hassam's painting style became simpler and flatter in composition and his colour became lusher - not unlike the manner of the Post-Impressionist Pierre Bonnard (1867-1947). In his fifties, in addition to his painting and pastel drawings, he devoted much of his time to printmaking - etching and lithography - producing numerous harbour and coastal scenes similar to James McNeill Whistler (18341903). All the while, he was showing his work to widespread critical acclaim. In particular he was a regular exhibitor at the annual shows of The Ten - a group of American modern artists interested in Impressionism, who included Frank W. Benson (1862-1951), William Merritt Chase (1849-1916), Thomas W. Dewing (1851-1938), William L. Metcalf (1858-1925), Robert Reid (1862-1929), Edmund C. Tarbell (1862-1938) and John H Twachtman (1853-1902). The group exhibited together during the period 1898-1919. Hassam also enjoyed a number of one-man shows, including (remarkably) one in 1901 at the Paris gallery of the eminent dealer Paul Durand-Ruel (1831-1922). Hassam's later period included his series of flag paintings - about 24 pictures in all - commemorating the festive events connected with World War I. The paintings show the changing display of flags that decked Fifth Avenue, earning the street the name "The Avenue of the Allies". The pictures allow us to trace the United States' involvement in the war, from support of the Allies, through entry into the hostilities, to final victory. Decorative as well as political, Hassam's flag paintings have their antecedents in works by the French Impressionists Monet and Pissarro. By the time he died, aged 75, Hassam was a wealthy and much honoured, though by this time he was viewed in artistic circles as a highly conservative figure. He bequeathed all his surviving works to the American Academy of Arts and Letters. Paintings by Childe Hassam can be seen in many of the best art museums throughout the world.  For biographies of other American Impressionist artists, see: Famous Painters.